For more than four years, Pinochet’s air force was paralyzed by 3,000 Scottish workers who refused to service its planes. If Vietnam was the first “television war,” then September 11, 1973 was arguably the first televised coup. Images of the brutal overthrow of Salvador Allende’s socialist government in Chile were beamed around the world in the days that followed, with few symbols of the CIA-backed assault on democracy proving more resonant than that of low-flying Hawker Hunter jets bombing the presidential palace. The body of Allende would later be pulled from the building, while his supporters were rounded up, tortured, and executed in their thousands. Among those following the faraway events was Robert Somerville, a member of the Communist Party and a union shop steward at a Rolls Royce plant in the Scottish town of East Kilbride, ten miles south of Glasgow. A few days after the coup, Somerville brought a motion condemning the military junta to a union meeting in his workplace, where it was passed. There was nothing unusual about this in itself, with the coup sending shock waves around the world and rapidly spawning an international solidarity movement. But there was an important difference about the East Kilbride plant: the factory was, by that time, the only one in the world that serviced the engines of the Hawker Hunter jets that were the mainstay of Chile’s air force. In the coming months the plant’s workers would organize a remarkable boycott that grounded most of Pinochet’s air force for years. For years, the story of their refusal was forgotten — but a new movie by the son of Chilean exiles aims to tell their tale. For the workers, though, it was easy to feel that their actions had little lasting effect, with the engines’ presence becoming part of everyday life at the factory while debates raged in the background. In any case, the engines were spirited away in a mysterious pre-dawn raid one day in August 1978, with the workers and union left feeling powerless. What became of them was never known, with even the license plates of the vehicles used to remove the engines turning out to be fake. Military involvement was suspected. The full story of that boycott, and the ultimate fate of the engines, has now been told for the first time in a crowdfunded, feature-length documentary, Nae Pasaran. Directed by Felipe Bustos Sierra, it premiered recently at the Glasgow Film Festival. It builds on a short film released in 2013, which is available online, and explores the impact of the workers’ stand in both Britain and Chile. Growing up in Belgium as the son of a student journalist who had been forced to flee Chile, Bustos Sierra was attending Chilean solidarity events from a young age and remembers the Rolls Royce boycott as part of the “mythology” of that movement. But with information on events in Chile and elsewhere being passed through convoluted networks of exiles and supporters, it was often second or third hand by the time it reached his family, making it hard to distinguish fact from fiction. Moving to Scotland as an adult, he began investigating further, which would prove to be the first step on a long journey. “I met the guys, and that was the big turning point, realizing that this was real and there was a way to try and tell the story in a more truthful way and find relevance with struggles happening now,” Bustos Sierra says. 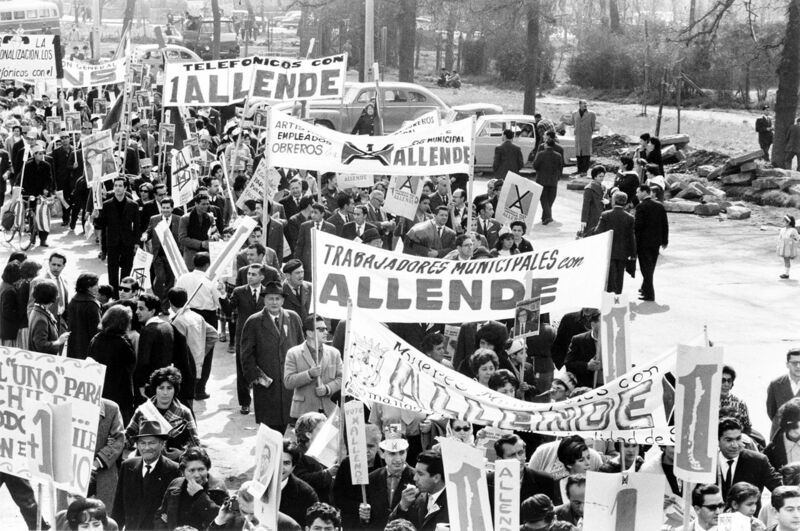 That journey is still ongoing, although along the way it has seen three of the workers — Somerville alongside Bob Fulton, the first to refuse the work the engines, and John Keenan, another senior shop steward — awarded the highest honor given by the Chilean government to citizens of other countries. They are, at a reasonable guess, the only East Kilbride pensioners who are also Commanders of the Republic of Chile. The film is a triumph, an inspiring story of cross-border solidarity that deserves to be retold, with the detail of the boycott beautifully interwoven with archive footage and interviews. While an initial plan to take some of the workers involved over to Chile proved impossible — Fulton is now 95, while Somerville is 82 — the narrative instead relies on showing those in both Scotland and Chile footage, and testimony, from the other country, as it delves into the impact of the “blacking,” and films their often emotional reactions. Rojas Vender bluntly describes the sorry state that the Chilean air force was in by the late 1970s, isolated on the world stage and unable to secure the servicing of their main fighter-jet engine. With most of their aircraft grounded, they were forced to scrape together spare parts from wherever they could source them. Israel and South Africa were a big help, Rojas Vender notes. The industrial action taken by the Rolls Royce workers in the spirit of international solidarity was not the first or last of its kind, although is still extremely rare, which is one reason why the story is so compelling. In 1920, dockworkers in London refused to load arms bound for anti-Bolshevik Polish forces, while in 2003, Scottish train drivers refused to support the military build-up for the invasion of Iraq. The response of workers in Britain to the coup in Chile was far from universal and, as the aircraft engines sat rusting in the grounds of an East Kilbride factory, engineers at shipyards on the Clyde were voting to continue working on warships set for delivery to Pinochet’s government, in defiance of their union’s position. Stopping repairs on a few jet engines was one thing, but refusing to work on the construction of warships would have potentially put hundreds out of work. That election would also mark the normalization of relations with Chile, as arms sales were quickly resumed. But what came after doesn’t diminish what the workers of East Kilbride were able to achieve over four years. The ability of a well-organized workforce to take a principled stand in defiance of a brutal reactionary regime is one worth remembering, celebrating, and retelling as the struggle to rebuild workplace resistance continues. Nae Pasaran, set for a wider release this September, is an inspiring and touching tribute to that stand. Liam Turbett is a freelance writer based in Glasgow, Scotland with an interest in social history and urban issues.